In White Fog Explainer, I establish the time-frame and spatial spread of the mysterious fog over Khan Sheikhoun on April 4. Said to be deadly sarin vapor from a bomb dropped by Syrian forces, it appears more like mass production of an unknown smoke or vapor in 2, 3, or maybe 4 spots, continuously for 20-25 minutes. Here we consider the southwestern spot. I initially placed that at the red circle at the bottom of that map, after analyzing the field of view from a great distance. At this random spot in the fields, I see nothing new in current, post-attack satellite photos available on Terrasever (stamped preview images for April 29 and May 6 available here, with options for sale I'm thinking about). Unfortunately, they do not offer anything from the days right after the incident, just from 25 days later. But not quite as far out, about 200 meters north of that circle, is another likely spot with features I might have noticed to begin with, and that shows fresh oddities in the new images. Below is how this area (black box) is currently shown on Google maps, next to what seems a small hill, the rubble of a farmhouse, water reservoir to the northwest, with a big tree right by that. The coordinates are: 35.426162, 36.642337. The new estimated area is my main point here, explained below. But first a short history of this spot, as I can see it. 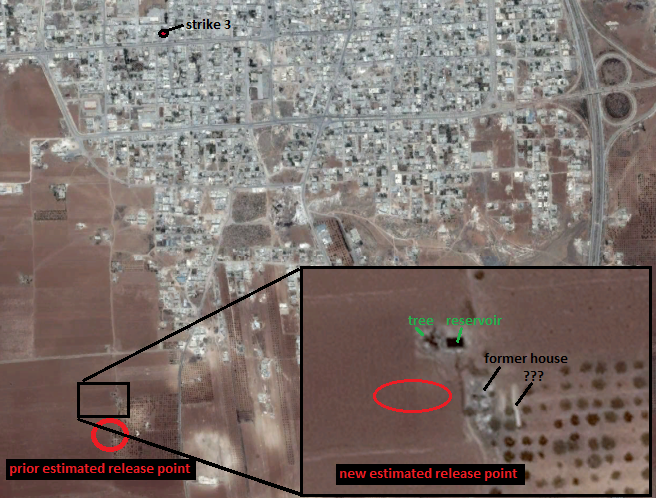 The Area, Up to 2014 "Liberation"
Google Earth's historical images show a small farmhouse was there in 2004, trough 2010-2012, and still there on May 1, 2014. Another larger structure to the southeast, up on the hill, remains intact through all this and up to now. Which is a house vs. a shed, which is the main one, or runs what (the orchard on the hill vs. the field to the west) is unclear. Note: What marks a road here is also a bit unclear, but it seems traffic come south, and goes around both sides of the house, but the main path further south runs on the west side. Luckily the next view is close in time, because that corner place with the reservoir changes sometime after May 1. By the pass of June 12, 2014, we get the view above - that building is destroyed, leaving just rubble. This is the current Google Maps image shown above. See how there's also a sort of line in the dirt added just east of the house site. The northern half is a bit fuzzy, and the southern half more distinct, and casting a small shadow (south end - next to an extra small (olive tree?)). We know the underlying soil here is light-colored, a limestone base, as seen at the cave hospital. So this may be some long excavation, or or just limestone gravel ... with a long mound, or a huge pipe, or ... ?? Could this be a lengthwise trench mass grave for a small family buried head-to-foot? or the same, covered with gravel? 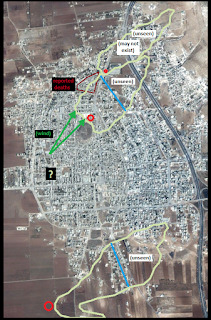 So as of the 25th - the two year anniversary of the Houla Massacre - the opposition was slaughtering its last Alawite soldiers and securing control of the whole town. Some people who had lived there safely would no longer be able to. Did some of them live in this farmhouse? The opposition VDC shows for May 24-June 11 just one Khan Sheikhoun civilian killed - Elwan Faisal Elwan, on May 28. I guess they mean he HAD been killed at Khanazat base earlier, by regime forces after they arrested him, and rebels just found that out on the 28th after taking over. The same day, 11 charred bodies, just one identified, were found in Maarat Numan, it says, killed in "a massacre due to the explosion of a car bomb in the Diesel market" - but not one of the car bombs used by the rebels a few days earlier. (all 13 Idlib dead 5-28) There also seem to be no obvious matches among the VDC's "regime fatalities" list for this span. So there are no clear story matches, but a house was also destroyed in this spot of interest at around the same time - probably the May 25 "liberation." And some massacres just don't get reported to the VDC or anyone - they just quietly happen. But a simple demolition of an outdated outbuilding wouldn't be called in either. Terraserver's new images show more recent things (previews available here). 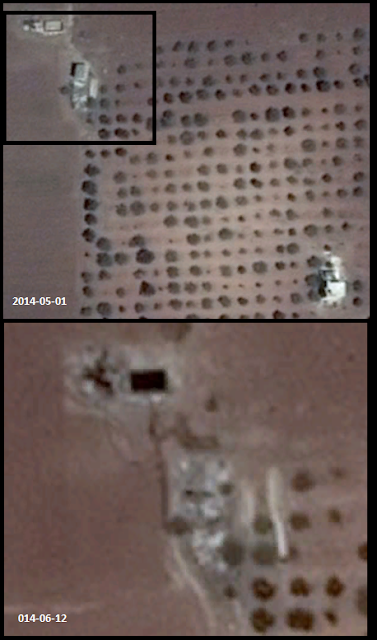 From mid-2014 through 2016 remains unclear, but on Feb. 21 of this year, we can see a new farmhouse has been built on the site of the old one, apparently a bit bigger, and perhaps two stories. The strange white line is invisible now, blended into the end of a newly re-contoured road between the trees, and surrounded with dirt mounds where new trees are being grown. Then, on April 29 and May 6, the site shows the house is gone. Who this was and why it would be torn down again remain unclear. For what it's worth, I don't imagine any Alawite famers moved into this place and started building after the rebel "liberation." The second house destruction there in three years leaves a partial foundation, but little noticeable rubble. A field to the northwest seems to have lots of large white rocks added to it. (??) Are they hiding evidence? Also since February, the tree or trees by the reservoir seem to be burned down, now the area looking dark with no tree casting its shadow. Was that to help fuel the unknown process or generate part of the smoke? The reservoir appears wet, but it's not clear how full it is. Possibly a lot of unusual spill along its south edge. The field right to the south is nice and green. Maybe all the watering caused the spillage, and nothing more? These seem like connected stations, like for two or three small sprinklers and a distributor. Or maybe it's something military - say, a missile launcher and radar unit, and something else, hiding somewhat in the vegetation (the height of which is unclear to me). Or maybe these are the stations for three large smoke machines of the kind seen here used in Aleppo last year to coat whole areas (those are quite low and easy to hide). Those tracks seem logical for watering the fields, but no other spots around show tracks like this, and they don't seem to extend to the west half of this same field, which seems just as green. This short walk or drive is at the site of a recent home destruction, and runs to what could be just where terrorists released part of their special effects fog for the April 4 false-flag incident. Maybe this goes nowhere, but I think it's worth mentioning. - (the various combinations may not work; these are all and/or). The last is interesting: was that building blasted on that day, in some way that caused dust for their effects fog? Presumably, they'd use something weaker and less showy than in the other spots, so the dust would stay near the ground instead of rising in a mushroom cloud. But it's possible there was a blast plume over this spot as well, maybe just after the video they show us (after the jets left), but long enough before the fog video (20-25 minutes unseen in between) that the plume has drifted completely away. Either way, it seems possible, but the volume of mist probably requires something else. But 25 days later, would tracks from that incident still show like this? Perhaps, if all those plants were crushed enough to remain dead. Or is it all or partly something else, but perhaps related? Maybe an ongoing search for bomb fragments based on a video analysis showing fog originating here? Or, dread... nothing of interest? This spot seems to be just about where the morning's surveillance flight passed, I think. The US-provided flight track claims to show jets attacking the city, as everyone claims, with dropped gravity bombs. 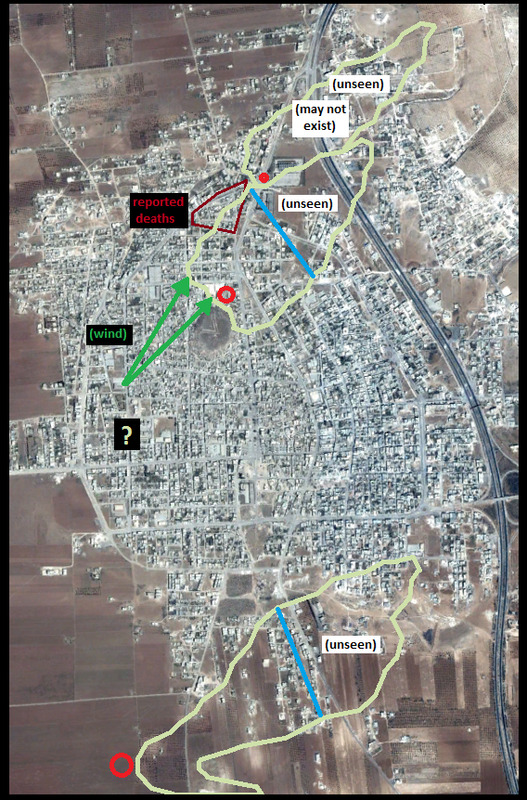 But the track shows the jets never passing over the city or any of the bomb sites, just arcing around the town at a distance. 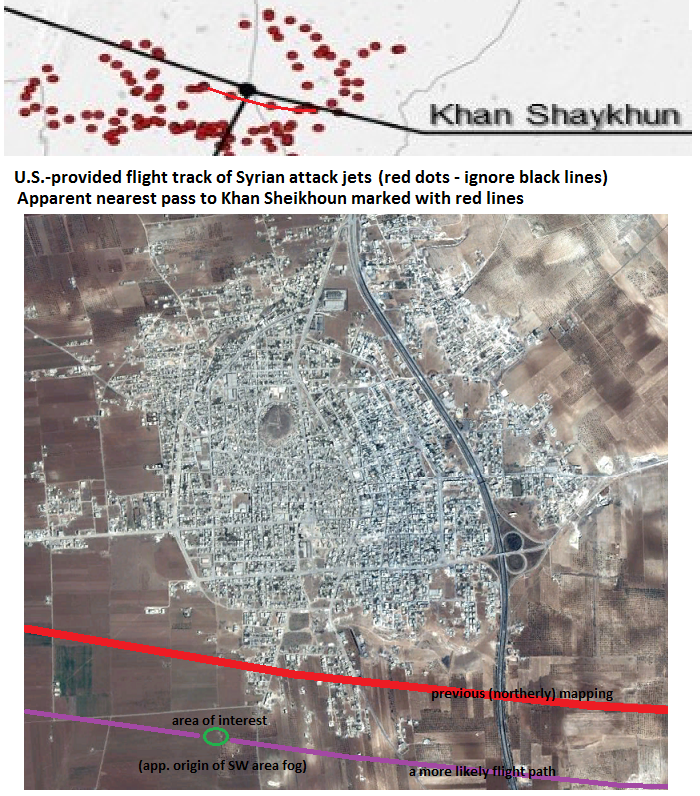 (right: provided track - stretched to scale, the black dot represents all but the furthest edges of the town - see the Shayray Airfield Link). 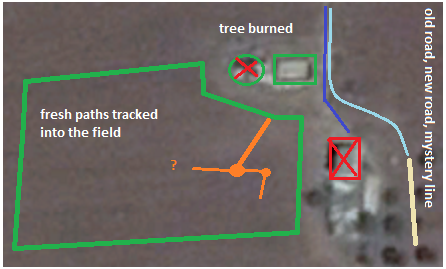 Here, I put that track closer to what it probably is (I didn't go and re-scale it) in purple, passing right over this area (green circle) Maybe they got a report late on the 3rd of something odd at this farmhouse area, and checked it out first thing in the morning. What did they see there moments before the false-flag attack began? I wish they took a photo, and could let me see it. If this spot is under the flight, it's the ONE spot that could have actually had a bomb dropped on it. But there's no sign of that happening while the other distant spots to the north pour smoke after the jets have departed. Even the white cloud is expanding already in the north, but there's still no sign of anything out here; only later on does fog appear (see below). Did they wait until the jet was gone to uncover their hidden machine and start it up?